Hello there! Today might possibly be one of the prettiest days we've had all fall. It's 70 degrees, sunny and not windy. The trees have turned and Mr. 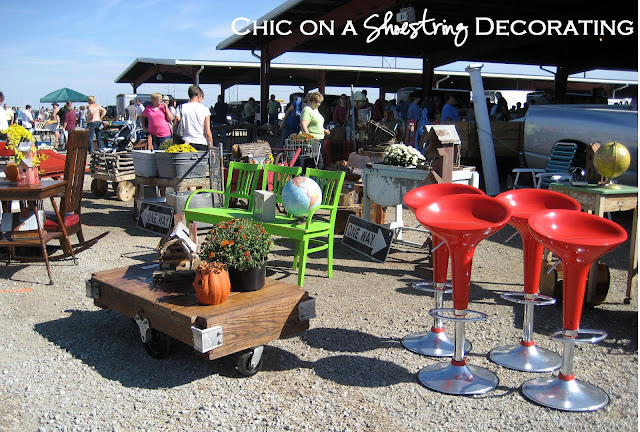 Chic and I went to an awesome antique/flea market (sans kids) this morning and had a great time. I usually go alone so it was a treat to have him with me. Plus, he carried around all my heavy bags, such a gentelman. I used to have a really low opinion of flea markets, thinking they only sold junk. Some of them do. But I've learned that all flea markets are not created equal. Some are awesome. A junker or thrifter's paradise of sorts. If you haven't been to one for a while you should definitely check one out again. 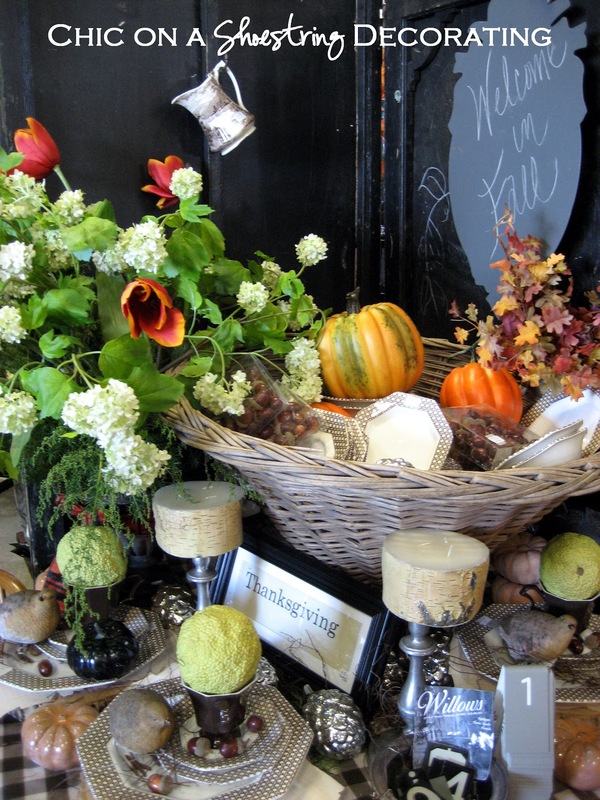 They can be a great source for decorating your home on a shoestring budget. A sweet coffee table on casters, a bright green bench, a few globes and some fun red stools. 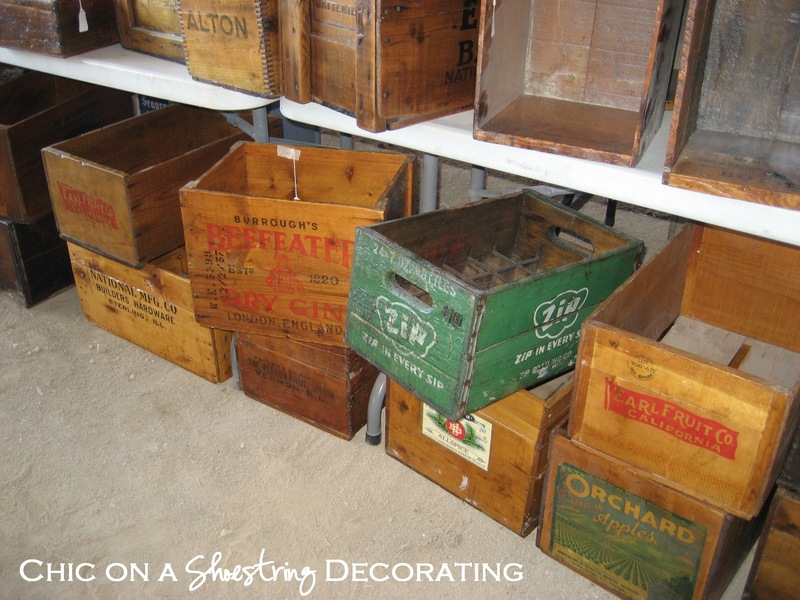 Gotta love old wooden crates. Lots of old, salvaged pieces just waiting to be repurposed. Lots of great and unique decorative items too! The great thing about flea markets are that the prices are mostly negotiable. Sellers will usually accept a reasonable offer. Don't be scared to ask. This market had some great food vendors. Today I had my first fresh apple cider slushie. OMG... deelish!! By the time I realized I should've taken a picture it was long gone! Speaking of my 31 day series, I realize I'm a couple days behind but I plan on completing in a timely manner so please stick with me.